Cape Cod Ready Mix Sales Manager Peter Zoni continues to be an instrumental part of how and why the industry education process has worked so well when it comes to its success with pervious concrete, reports NRMCA Senior Director, National Resources, Doug O'Neill. sections of pervious in our own parking lot, but also reached out to local towns and offered up 'free of charge' small sections of pervious that they could then watch to see how they performed. The process allowed us to 'practice' getting our mix right, it allowed our contractors to 'practice' working with the material and it allowed the towns to become personally invested in the success of the sections without having the financial pressures of trying something new." "We are now inviting neighboring towns to come see these test sections," Zoni continued. "We are working with NRMCA and MACAPA to further educate the designers and town officials and we are continuing our efforts to educate more contractors." Just recently, Cape Cod Ready Mix in conjunction with Howie Burns and Michael Kane with MACAPA conducted an NRMCA pervious contractor certification course attended by 25 new installers. This certification course (see photo above) included a hands-on section where attendees could help place pervious despite the winter weather. The placement was held inside a truck maintenance bay of a building adjacent to one of Cape Cod RM’s plants. Burns also commented on how pervious helped them move into other aspects of concrete promotion. "We at MACAPA have observed during our pervious concrete promotion process just how easy it becomes to roll into discussions on the benefits of conventional concrete paving," he said. "Pervious is opening doors today that have been difficult for us to enter in the past." Cape Cod RM has also realized the importance of marketing pervious concrete. "Those of us in the concrete industry know that pervious is a TRUE solution to stormwater issues, but Cape Cod RM, is bringing that information or 'education' to the people who need to know - the designers and potential owners," O'Neill said. 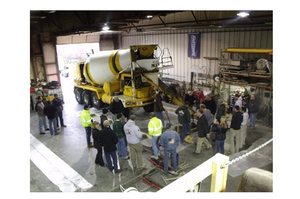 "It is now taking the next step with another round of educational meetings aimed at contractors to introduce them to the marketing aspect of pervious concrete."